In 1890, Thomas A. Lawton married a 32-year-old widow named Mary and she died six years later. 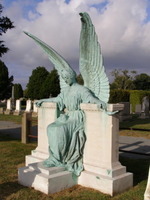 Thomas was heartbroken and mourned her loss so much that he commissioned a double memorial – for his beloved and himself – featuring a magnificent bronze angel with outstretched wings at Island Cemetery in Newport, Rhode Island. When asked if he wanted to add an epitaph, he replied, “No, the angel says it all.” Thomas managed to get over the loss of Mary and married a lady named Ida, but when he died in 1914, he was laid to rest beside Mary. Ida lived until 1927 and she, too, is buried in Island Cemetery.